I know your reading instruction time is getting squeezed. You’re expected to meet with more groups that meet the specific needs of your students, track more data, and now you have more required tests to prep for and give. The one thing you don’t have is more time! Sadly, I’ve heard many teachers say they don’t have time to read aloud to their kids because it just doesn’t fit into their schedule. What you need to do Teach Smart! 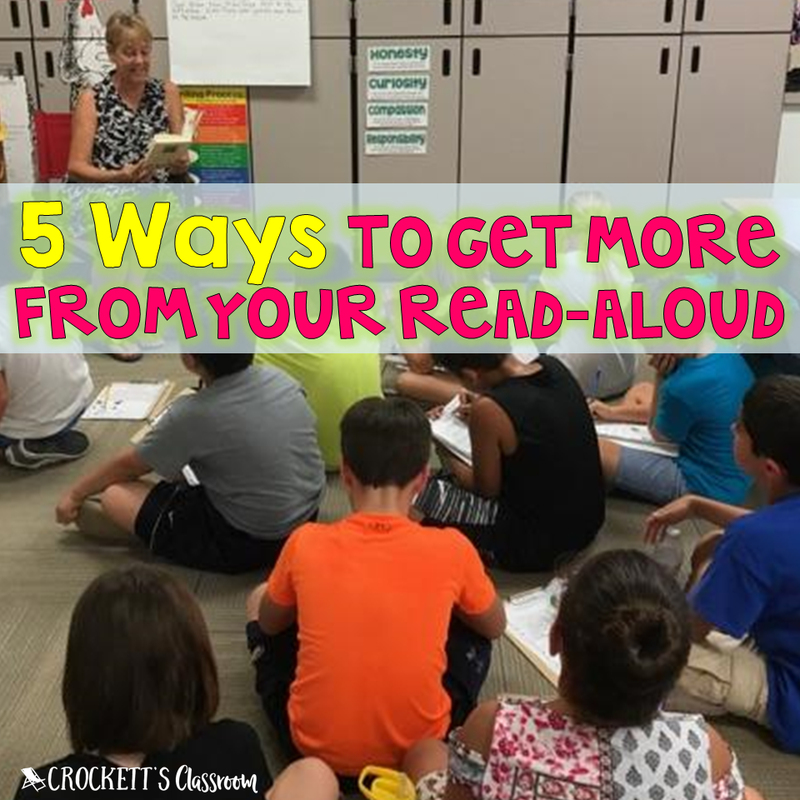 Instead of doing away with your read-aloud time, you can do more with that time. 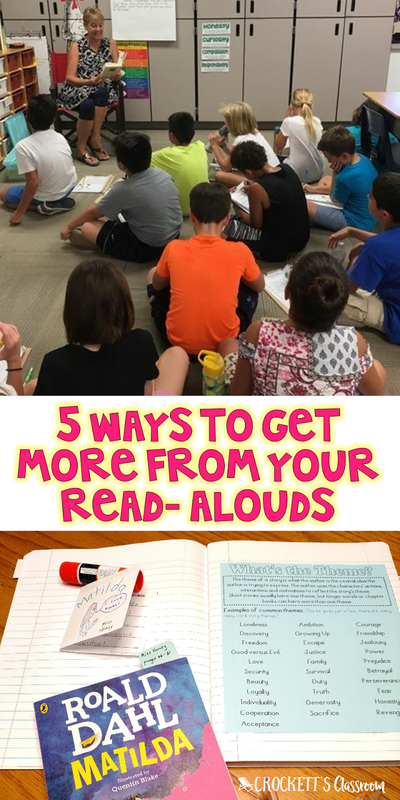 Here are 5 tips for getting more from your read-aloud time. 1. Choose a book that showcases a skill or strategy you're currently teaching. That may sound simple, but you want to make sure the book is a good example of the focus strategy. 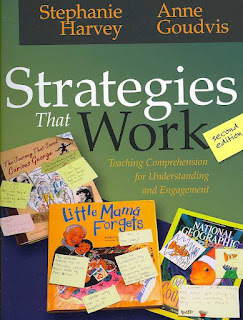 My first go-to resource is the book Strategies the Work by Stephanie Harvey and Anne Goudvis. This essential book has suggested books for each comprehension strategy, along with lesson ideas. There are also a lot of great websites and lists that pair up books with reading strategies. Here are a few I've used. The plan should have the focus of the read aloud, what the teacher will do and what the students will do. The focus will be the skill or strategy you want to either introduce or reinforce with your discussion questions. Decide how many pages you will read before you stop for a discussion. 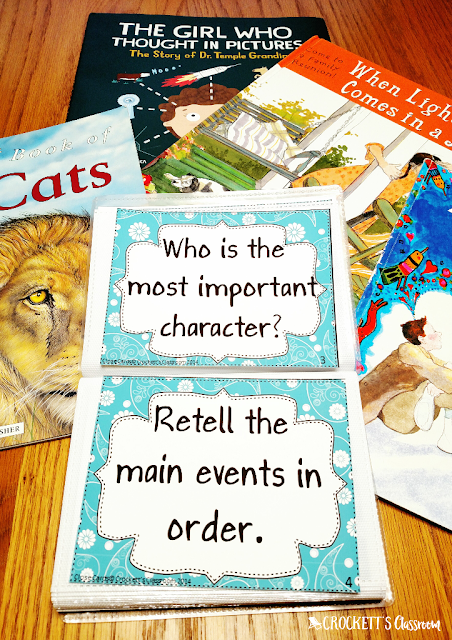 For a picture book, you may choose to stop several times throughout the book. For a chapter book, you may choose to stop only a couple of times for each chapter. I like to write down one or two questions I want to make sure to ask during the discussion. You will probably think of other questions during the discussions, but two is a good number to begin the discussion. The plan should also include what the kids will do. Will they simply join the discussion? Will they share ideas with a partner? Will they write in a journal? 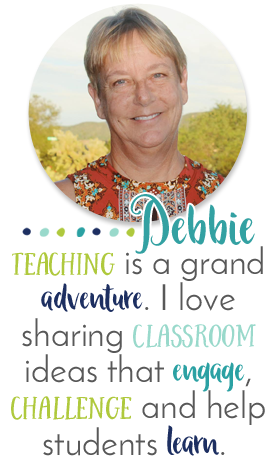 For more ideas on how to involve students, see the next tip. For an idea of how to write these read-aloud plans, I've put together an example of how I write my plans. (Click here to download.) I like to have little cards with me instead of a full piece of paper. But, you can leave these pages whole if you prefer. I made the pages editable so you can type in your plans. Of course, you can also print them as they are and write in your plans. There are times when the only reason I’m reading aloud is to simply enjoy the story. When that is my purpose, then my students don’t need to do anything but relax and listen. But, when I’m reading aloud with an academic purpose, then I want my students involved. I’ve done this several different ways. To make sure all students participate I like using name sticks. 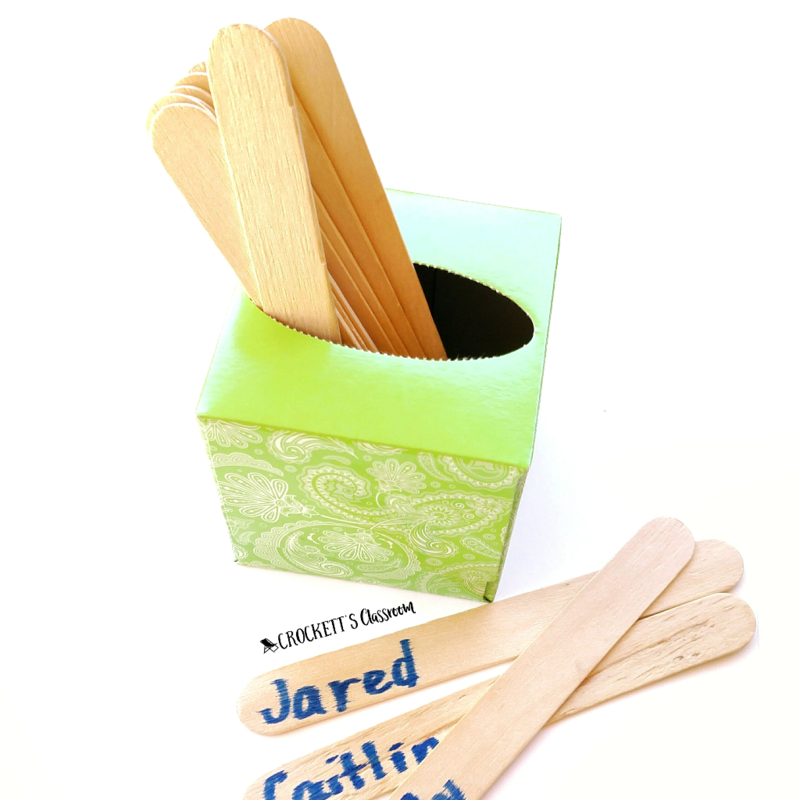 I keep a set of craft sticks with student names beside my reading chair. That way I can easily pull a stick and call on random students during a discussion. >>> Partner sharing To get all students thinking and talking I like using partner sharing. After I ask a question I tell students to find a neighbor to discuss the question. It’s a requirement that all students find a partner sitting next to them. No one is allowed to say, “I can’t find a partner.” I generally let students choose their own space in our listening area, I’ve had some years where that didn’t work. So, I sometimes assign seating spaces and also sharing partners. >>> Student Journals At other times, I have students write their responses or thoughts in a journal. 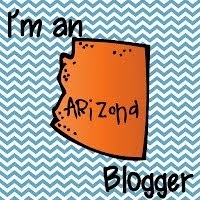 It might be a year-long reading or literacy journal they have or a small journal I’ve put together for a specific book. Once, when I was reading The Invention of Hugo Cabret by Brian Selznick, I let the kids sketch while I was reading. That book is told partly through illustrations so it seemed natural to let the kids draw and sketch as they listened. I limit the amount of writing I ask students to do during a read aloud because it takes up time. Most of the time I send students back to their desks with a writing prompt. 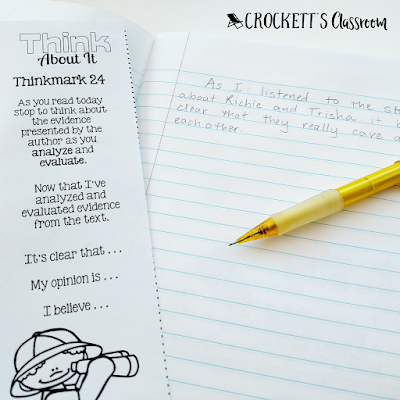 Reading Think-Marks are a great way to get students thinking and lead nicely into response topics. >>>Thinking Notes I love, love, love using sticky notes! They are my favorite way to get kids involved with read-alouds. I usually have an anchor chart with the focus strategy. But, sometimes it's just a general anchor chart called “Tune into your Thinking.” During the discussion, I’ll ask kids to jot down their thoughts and add it to our anchor chart. After you read a book aloud, don’t put it back on the shelf. Put it in a literacy center. Kids can read it again and again. Picture books work well because they can be read in a short time. 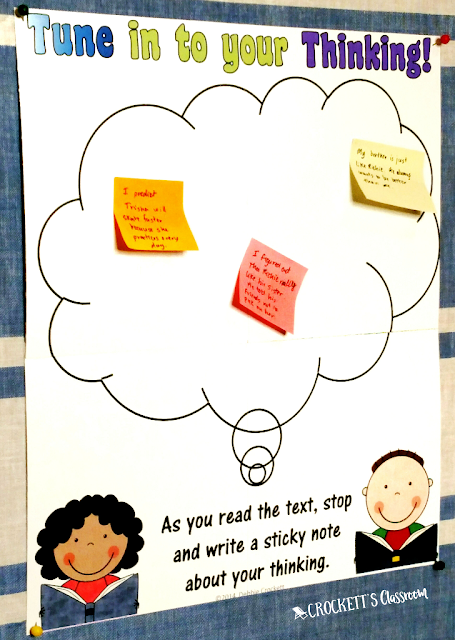 But, chapter books can also be used by placing bookmarks or sticky notes so just one or two chapters are used at the center activity. The center can work on vocabulary, phonics skills, comprehension skills, or even as an inspiration in a writing center. One of my favorite centers is a collection of picture books. I keep five to ten picture books there at all times. The books may stay the same for several weeks, but I change the activity. One week the center might focus on fluency practice. The next week might be a character study activity and the next week might be finding the theme of the books. If you put a chapter book in the literacy center you can have students read one of the chapters and then write a response in their journals. 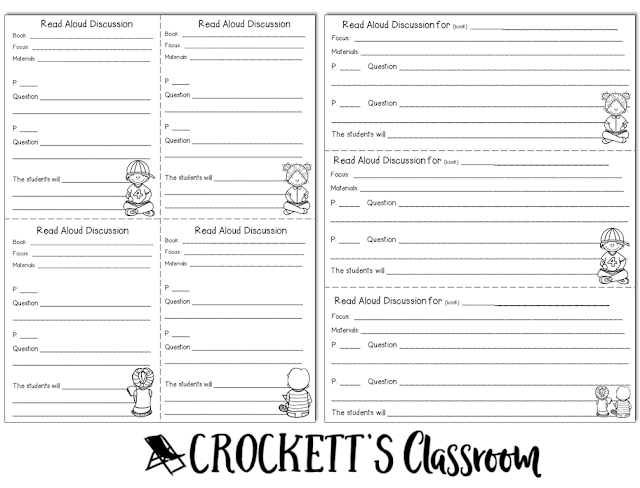 Along with the center, I keep a little photo album filled with response stems and questions. The handy thing about the little photo album (from the dollar store) is I can fill it with the questions and/or response stems I want them to use that week. I can even have these little albums set up for specific students so it's tailored to their specific needs. Great books can be enjoyed over and over. Don't think that after a book is read one time you can't revisit it again later that year. In fact, kids love hearing the stories again. On the second read aloud you can dig deeper and show your students how to think beyond the text. For example, I always read the chapter book Because of Winn Dixie twice every year. This is the book I read to my students during the first two weeks of the school year. As I read, we talk about the important life lessons we can learn from the characters in the story. Later in the year, usually during the last quarter, I'll read it again. This time I'll focus on reviewing some of the reading strategies we've learned through the year. 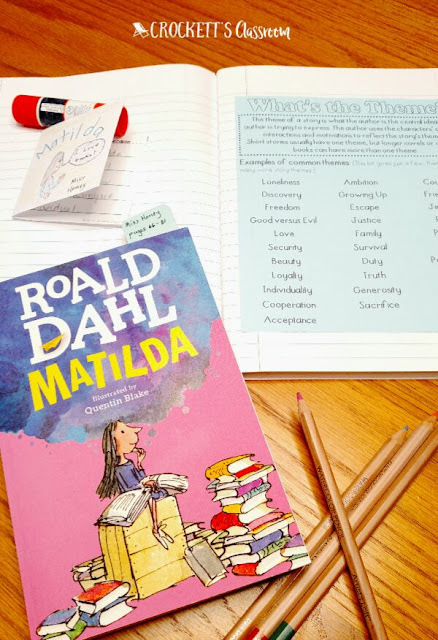 Students will write in their journals every day, showing they can make inferences, draw conclusions, decide on the theme of the story, etc. Many times I'll use a class set of books for my second read aloud. That way students can follow along with my reading and then have the book to find evidence for the strategy practice that day. I hope you've gained a few useful ideas from this blog post. Teaching time is precious and we need to make the most out of every minute. How do you get more out of your read-aloud time?